Before the 10th century, most English buildings were constructed of wood; stone buildings were small and roughly made. The Norman Romanesque style replaced the Saxon style in England after the Norman Conquest in 1066, and from about 1120 to 1200, builders erected monumental Norman structures, including numerous churches and cathedrals. England developed a tradition, consciously or not, in which their churches were longer and not as tall as counterparts on the European continent. The long, narrow buildings were constructed with heavy walls and piers, rectangular apses, double transepts, and deeply recessed portals. 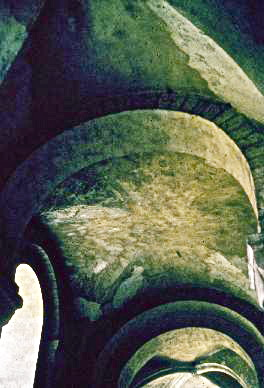 Naves were covered with flat ceilings, later replaced by vaults, and side aisles were usually covered with groined vaults. As mentioned previously, many major churches were placed at the edges of cities, thus enabling their grounds to be open and green. This is Winchester Cathedral. 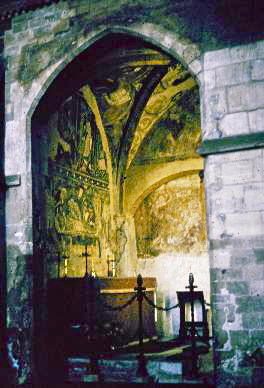 The following illustrations are in Winchester Cathedral, in what was the crypt. Begun in 1079 in the Romanesque style, it is below the local water table, and floods in winter. 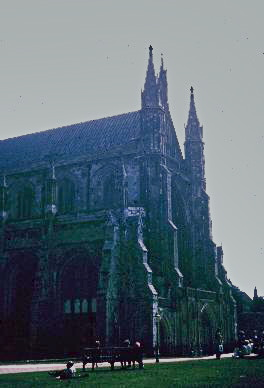 It is accessible from the north transept. Notice that the opening arch is pointed – this is a later construction. 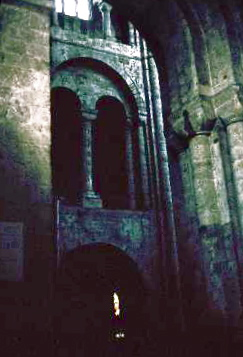 The area inside that pointed arch is the original Romanesque, and the little of that original which remains. The roof construction might have been a groin vault, but it is obviously not very well articulated. The original might have been there, but the centuries have taken their toll.